Imagine being alone in the isolated, dark and mysterious woods hearing creaking trees and rustling leaves. But to Brian, the only thing that is true is peace. 16-year-old Brian enjoys hunting but he wishes to be alone. A few days later, Brian was hunting and he heard a sound from a whimpering animal. The sound was coming from across the lake therefore he paddles across the lake from the other side. When he arrives on the island he finds the injured dog, and there is an enormous rip on the side of the dog’s body. Brian becomes anxious to help, therefore he sews the rip and saves the dog from dying. Throughout the whole book, Brian was trying to figure out what hurt the dog because the marks looked like they came from an animal. At the end of the book there is a twist and Brian starts to feel hopeless about his search. 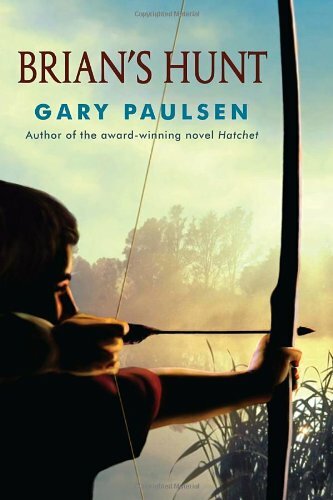 Brian’s Hunt was written by Gary Paulsen. Brain ends up living in the woods throughout the whole book. Alone, has no one but the animals and hunting to keep him alive. The book is a mystery, and Brian try’s to solve it. The beginning of the book was a bit long and boring, because the writer only talks about Brian settling in and Brians passion for hunting. But the middle of the story starts to pick up and becomes more engaging. The authors descriptions of the sounds were effective because they seemed real. I would recommend this book for 6th grade. If you enjoy books about survival and animals, then this book is for you. If you adore dogs then you will enjoy reading about the bond between Brian and the dog.